Roger Black Gold 2 in 1 Cross Trainer & Exercise Bike. Programmes include: manual, 9 preset, heart rate control, rate recovery and body fat analysis. Console feedback including: speed, time, distance, calories, pulse, RPM and program. 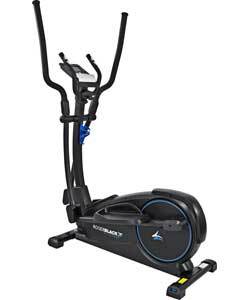 Roger Black JX-7059CW Magnetic Cross Trainer.